The Scan Man believes this scanner will be a big winner for Kodak. The Kodak i920 is a compact desktop scanner that preserves your precious desk space with a small footprint. It will make you more efficient as you are able to automate repetitive tasks. The scanner also includes Presto Bizcard software to scan your business cards into a database or your contact management system. With Kodak’s Smart Touch functionality, the KODAK SCANMATE i920 gets important business documents into your information network in an instant. That’s because Smart Touch automates multiple-step scanning operations by capturing, processing, and sending information for you. At the touch of a button, Smart Touch helps you make e-mail attachments, picture files, searchable PDFs, and more. Plus it files documents or sends them to “the cloud.” For example, if a business configured its ID card scanning process as Option 2, an employee could simply select “2” on the scanner display. The ID card would be scanned, processed, and sent to its proper destination — automatically. Save space – compact, highly portable design takes up less desk space. Make great images- Kodak ‘Perfect Page document imaging is built in – just presss the button and get great images with bright colors and crisp text. 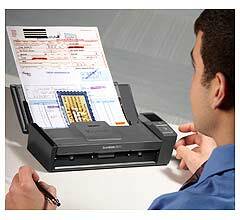 Scan it all – reliably handles a wide range of document with the 20 sheet automatic document feeder, including extra-long documents, business cards, ID cards, and embossed hard cards. Stay in contact – Bundled software helps you easily edit and synchronize business card info with your contact applications. Integrate easily – TWAIN and ISIS drivers allow quick compatibility with most scanning software. Get peace of mind. – Kodak’s three year limited warranty supports Kodak’s commitment to superior workmanship. (portrait, letter size) Bitonal/grayscale: Up to 20 ppm/40 ipm at 200 dpi. Color up to 15 ppm/30 ipm at 200 dpi. Maximum Document Size 8.5 in. x 65 in. Minimum Document Size 3.2 in. x 2.1 in.